I have three children. Just attempting to keep my house clean is a chore. (Am I the only one who seems to always be cleaning something?) I need products that are simple to use, while getting the job done! Natural House’s products use an eco-friendly cleaning method of probiotics that create a beneficial, odor eating ecosystem to naturally drive out and digest odors at their source. The plant-based ingredients are eco-friendly, non-toxic and biodegradable to naturally fight the toughest problems you face in your house. 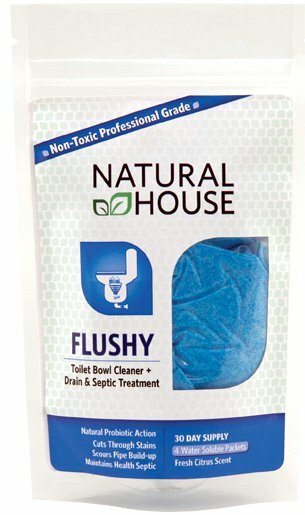 I was recently sent three Natural House products to try in my house: Sinky, Flushy and Trashy. Sinky is used in your sink or disposal system. You simply put a single cleaning pouch into the sink, turn on the hot water for 5-10 seconds, and watch the foaming action go to work! It breaks down grease and food scraps to help prevent clogs and slow drains! 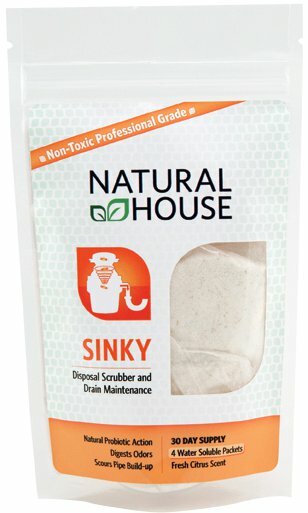 Used weekly, Sinky will scour your drain and disposal driving out odors at their source. Flushy is used in your toilet bowl. Each packet is a powerful toilet bowl cleaner + Drain and Septic Treatment in one! The professional strength formula cuts through stains, hard water and calcium deposits in the bowl! It was simple to use and neat to watch! Toss a packet into the toilet bowl, watch the foam for about 25 seconds, then flush. The probiotics continue to consume toilet paper and waste build up in the p-trap, drain and pipes, and maintains the health of your septic system. To purchase Natural House products, please click here or to purchase through Amazon, click here. One lucky The Frugal Mom reader will win a 30 day supply of Sinky, Flushy and Trashy! Entries will be received through November 9, 2011 at 11:59 PM (cst). This giveaway is open to US residents, only. Disclaimer: I received Natural House Products for review purposes. No other compensation was received. I like cleaning the kitchen. I feel a sense of accomplishment once it's done. I liked the frugal mom on facebook. Liked the frugal mom on facebook. I love cleaning the kitchen because after I'm done its always a vast improvement which makes me feel like I've accomplished something…although that's before I look behind me to see what the kids were messing while I was cleaning the kitchen! I like to clean the kitchen! Like to clean? Not really. But if I have to pick a room I'd say my bedroom. I like cleaning my bedroom so that I feel like I rest better in there.